Chinese feathered dinosaurs, where are the skeptics? After hearing paleontologist Paul Willis debate Carl Wieland in August 2003,1 it was with great interest that I visited the travelling display of dinosaur fossils from China. In the debate, we were told that Dr Willis had said, ‘God created Liaoning [the area of China, where the so-called feathered dinosaur fossils were found] because He hated creationists.’ Of course such statements are meant to mock, because Paul Willis does not believe God created anything. Yet, he was keen to tell the mainly Christian audience that they could believe in God and in millions of years. We would expect, however, that, as Australian Skeptic of the Year, belief in the God of the Bible would receive the same amount of scorn in a different venue. Figure 1. 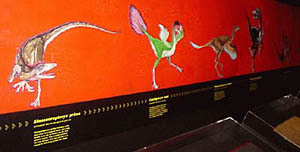 The colourful model of Caudipteryx zoui dwarfed by the tailbones of its supposed ancestor Yangchuanosaurus huopingensis. So finding out what Paul has put his faith in was a question in the back of my mind as we entered the display at the Queensland Museum. The creativity of the models’ sculptors was evident. The faces and colours they produced showed a strong Chinese influence, similar to the stylized dragons often seen in Chinese art. However, I was struck by the likeness of several of the models to modern ground-dwelling birds, such as the roadrunner and cassowary, though much more colourful (figure 1). Given the authoritative presentation and visually understandable ‘evidence’, it was clear that the exhibit would convince most people that dinosaurs evolved into birds hundreds of millions of years ago. The real ‘bones’ of the exhibition, the fossils, were displayed opposite the models. They were under further interpretative drawings presumably showing, via a line of arrows, the lineage of evolution from dinosaurs to birds (figures 2 and 3). Unfortunately not all the specimens were on display at the Queensland Museum but one would expect that the fossils presented some of the best examples of the available fossil data. The interpretive sequence of drawings above the fossil slabs. Note the line of arrows implying an evolutionary relationship. The only bird in this sequence is Archaeopteryx from Germany, while the ‘feathered’ dinosaurs are all from China. Three smaller Chinese bird fossils Sinornis santensis, Changchengornis hengdaoziensis and Confuciusornis sanctus (all ‘125 Ma’) were shown after Archaeopteryx, and were described as ‘lacking the long bony tail of their [supposed] ancestors’ and having ‘larger keeled breastbones’. The first obvious inconsistency came to mind while looking at the evidence for feathers. Sinosauropterxy prima had what appears to be a dark fuzzy outline surrounding the bones, apparently interpreted as the trace of hair-like filaments. I must confess that it looked much like the shading artists will often do around pencil drawings to emphasize the outline of an important object. The guidebook describes these ‘proto-feathers’ as feather-like structures.3 It explains that they appear as impressions in the fine-grained matrix or as a halo of darker, fibrous-like areas, usually at right angles to the bones, although not always contacting them. Certainly this evidence is vague. Did some dinosaur have a furry coating, or is this ‘fuzz’ just an artefact of the preservation or recovery process? 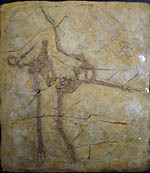 Caudipteryx (‘Caudi’, as Dr Willis affectionately nicknamed it) showed some long fibrous-looking traces in the area of the tail, similar to fossils of thin reed-like plants. To claim that they are feathers is clearly a statement of faith in a worldview, not a scientific observation. Figure 5. The interpretative key for Protarchaeopteryx robusta. Note indication for feathers in top left of slab. The information displayed below Protarchaeopteryx robusta indicated that detached feathers could be seen in the top left of the slab, but no matter how closely I looked, I could see no markings in that area consistent with the claim (compare figures 4 and 5). Finally, the reproduction of Sinornithosaurus milleni again left me wondering how anyone could conclude that the linear scratched traces surrounding the bones were feathers. The exhibition displayed a family tree alongside each of the models and alongside the larger dinosaur fossils. These trees showed that the closest relative to the supposed ancestor of both birds and theropods was the 5-metre-tall Yangchuanosaurus huopingensis. All the so-called feathered dinosaurs were further along the same branch of the tree (later) away from this supposed family split. So, in this scenario, feathers must evolve twice, once for the birds and once for the feathered dinosaurs, not once as implied by the sequence from Sinosauropterxy to Archaeopteryx. This sequence also completely ignores the dating of the fossils. Not only is Archaeopteryx 25 million years older than the oldest of its supposed ancestors, but evidence for birds from footprints dates back to 225 Ma, according to their own evolutionary dating. So who are the real skeptics? Obviously not the Australian Skeptics who sponsored the guidebook published by the Australian Museum.3 One suspects that their anti-creationist agenda is clouding their objectivity. 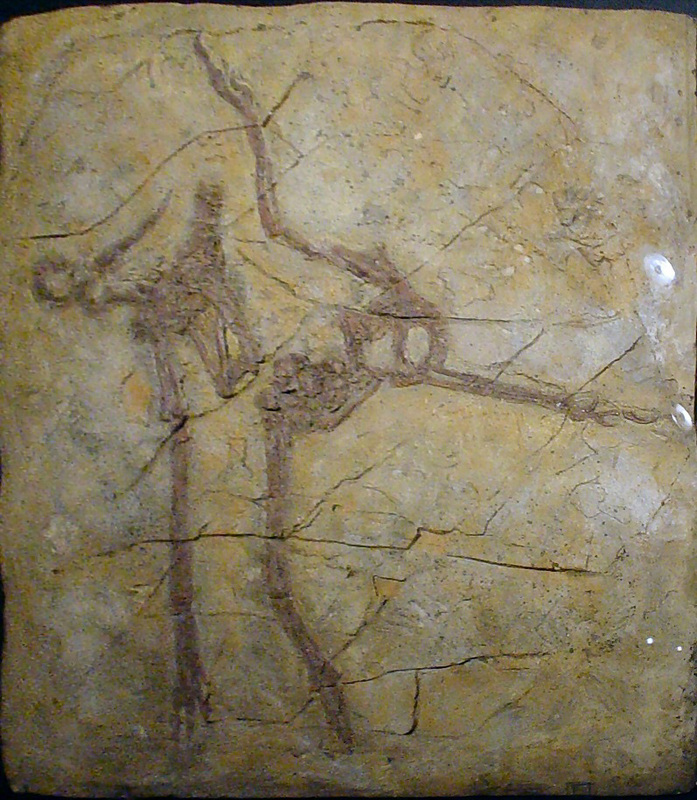 The guidebook for the exhibition mentions the exposed fraud, ‘Archaeoraptor, which so badly fooled National Geographic in 1999’.3 A review of the literature for the recent discovery of a supposed four-winged dinosaur, Microraptor,6 reveals that all the fossils of Microraptor showing feathers were purchased, as was Archaeoraptor, rather than being found in-situ by paleontologists. I can’t help wondering how valid Microraptor is and whose face may end up with egg on it this time. Certainly it is not the kind of evidence I would want to stake my faith on. Available on DVD: The Great Genesis Debate: Wieland vs. Willis, Creation Ministries International, 2003. Return to text. Ma—millions of years. The dates shown are given in the exhibit. Such dates are not accepted within a biblical framework. Return to text. Lavarack, J.W. (ed. 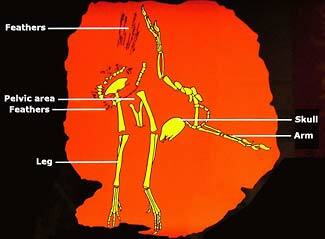 ), Chinese Dinosaurs: Dragon Bones & Dragon Birds; in: Riversleigh Notes, Issue No. 53, 2nd Ed., The Riversleigh Society and The Australian Museum, 2003. Return to text. Dinosaur Myths and Misinformation, <www.peripatus.gen.nz/Paleontology/DinMyt.html>, 7 June 2004. For further doubts about the feathered dinosaurs see: Richard Hinchliffe, The forward march of the bird-dinosaurs halted? Science 278(5338):596–597, 1997; Sarfati, J., Skeptics/Australian Museum ‘Feathered Dinosaur’ display: Knockdown argument against creation? Return to text. Maniraptora (‘Seizing Hands’) Birds and their Closest Relatives, <www.ucmp.berkeley.edu/diapsids/saurischia/maniraptora.html>, 7 June 2004. Return to text. 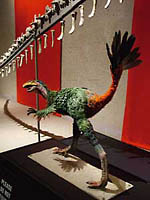 Microraptor was announced in January 2003 after the travelling Chinese exhibit was put together. No fossil evidence was available to view, but is discussed in the guidebook. Return to text.